Okay, so I'm a little behind. I haven't posted anything in awhile, so it's time to post 2 of my latest projects! 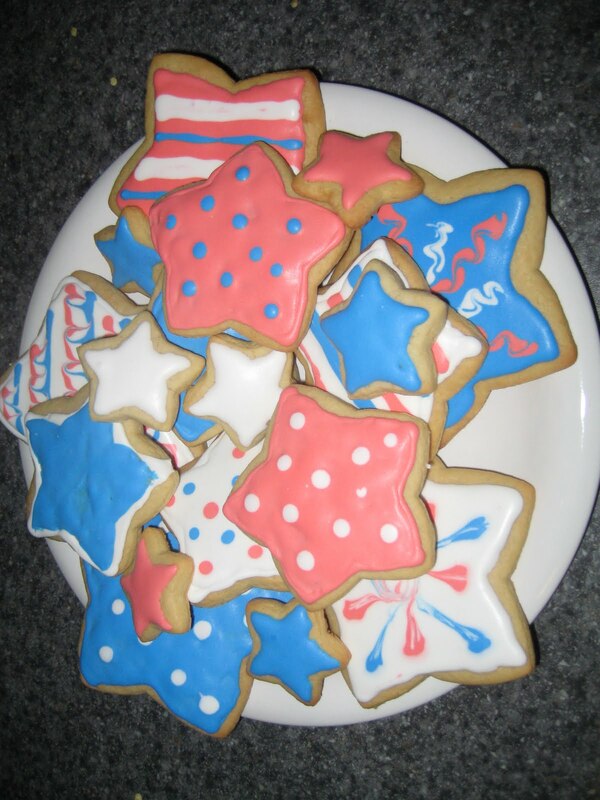 I made these 4th of July cookies for a party we were going to with some friends. This was my first time using squeeze bottles to flood the cookies and I was very happy with how they turned out. I'm fairly certain I'm a little obsessed with the squeeze bottles now! They make clean-up SO easy and the tip on them is about the same size as a #3 decorating tip. In case you're wondering where you find such squeeze bottles, just go to your local craft store! I got mine at Michaels :). Anyways, I used my traditional sugar cookie recipe (it uses lemon extract) for these cookies and made sure to roll them out a little thicker than usual. This helps them stay soft! My only disappointment with these was the color of "red" I was able to achieve. I desperately need to get some new food coloring paste - preferably the Americolor brand. The Wilton brand just can't quite ever get the right shade of red or black. Luckily with the group I was taking these cookies to that didn't matter! They just needed to taste delicious, and they did!